Olympic gold medalist Michael Phelps looks at the scoreboard following the final of the men's 100-meter freestyle at the Charlotte UltraSwim swim meet in Charlotte, N.C., Sunday, May 17. 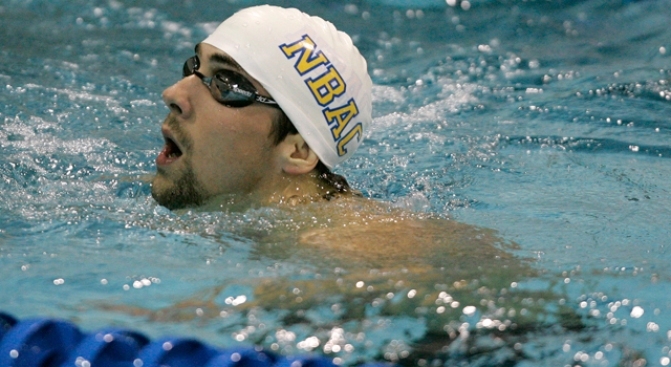 CHARLOTTE, N.C. -- Two days, two losses for Michael Phelps. Phelps was beaten again at the Charlotte UltraSwim, losing to French star Frederick Bousquet in the 100-meter freestyle Sunday night. Phelps touched nearly a full second behind Bousquet, world-record holder in the 50 free, after losing his first final in nearly a year the previous night. Aaron Peirsol beat Phelps in the 200 backstroke. Bousquet went out strong, ensuring he had a big enough lead to hold off Phelps at the end — even as the winningest Olympian ever experimented with a new straight-arm stroke that is supposed to provide more speed. The Frenchman touched in 48.22 seconds, while Phelps never really had a chance and finished second in 49.04. "The biggest thing that killed me were my turns and my finishes," said Phelps, who holds the American record in the 100 free at 47.51. "I'm not disappointed with that time, but the finish was awful. There's small things I need to work on. But overall, it was a good meet." The North Carolina meet was his first since capturing a record eight gold medals at the Beijing Olympics. The nine-month layoff was the longest of Phelps' career, though he had intended to come back earlier -- after being photographed using a marijuana pipe, a picture that wound up on the front page of a British tabloid, he was given a three-month suspension by USA Swimming. The sanction ended May 5, and Phelps was eager to start competing again. He entered five events at Charlotte and won the first two, the 200 free and 100 back, both of which were part of his gold-medal haul in China. But Phelps still has some work to do in the 200 back and 100 free, two events he hopes to add to his repertoire while dropping several races he won at Athens and Beijing. It's all part of his plan to take on new challenges — and stay motivated — heading into his final Olympics at London. Nothing gets Phelps going like a loss. Or two. "This is something that will motivate me to fix those things over the next few weeks," he said. "I'm kind of mad at myself. I wanted to break 49. I was five-hundredths off it with the two stupid mistakes I made." Phelps was kicking himself for having to take an extra stroke going into the turn, and again at the finish. Plus, he was experimenting with a straight-arm stroke that he believes will help him be more competitive in the sprint events. He started out with the standard stroke — elbow bent — before switching to the windmill-like motion for the second half of the opening lap. After the flip, Phelps went back to the regular stroke, then switched again to the straight arm for the final 15 meters. "Did he do that? Really? Whoa," said the Frenchman, who last month became the first swimmer to break 21 seconds in the 50 free. "That's even more impressive. To go 49.0, which is a pretty decent time in season, and change up the strokes a couple of times during the race, that's pretty impressive." All things considered, Phelps said he was pleased with his performance. In addition to the two wins and two runner-up finishes, he entered the 50 free to get in some extra work with his new stroke. He actually qualified for the final of that event — barely — but scratched. "For my first meet back, I have no complaints," he said. "We're on the right track. This is exactly where I want to be." Bousquet covered the opening lap in a blistering 22.83 seconds, 0.99 ahead of Phelps, and didn't lose much of his advantage on his return to the wall. "Whenever you race that guy, you can't count on your back-end speed to beat him," Bousquet said. "I knew I had to use my strength, which is my speed, and go out as fast as I could." Phelps knows what he needs to work on. "I need some of Fred's first-half speed," the American marveled. "He sure takes it out." Bousquet was a late addition to the four-day meet. He doesn't usually swim the 100 free in season, but couldn't pass up a chance to go against Phelps. "Tonight's race helped me get motivated a lot," the French star said. "The fact he was in the race and the fact we were next to each other, too, definitely helped me to get motivated and get my head into it." Rising star Dagny Knutson won her fourth event of the meet in the women's 200 individual medley. The 17-year-old North Dakotan, who trains on her own and without benefit of a 50-meter indoor pool, touched first in 2 minute, 12.87 seconds, beating out 2008 Olympian Julia Smit by nearly two seconds. Aaron Peirsol completed his sweep of the backstroke events with a victory in the 200. The previous night, he handed Phelps his first finals loss in 364 days, having beaten him in the 200 back at Santa Clara, Calif., in the lead-up to the Olympics. The other winners on the final night of the meet: Joe Kinderwater in the men's 800 freestyle, Brazil's Thiago Pereira in the 200 individual medley (beating out Ryan Lochte), Emily Brunemann in the women's 1,500 free, Elizabeth Beisel in the 200 back and Amanda Weir in the 100 free.